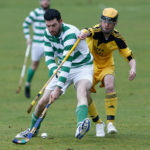 Fort William will play Marine Harvest National Division shinty again next season following their 2-0 win over Inveraray in their noon throw up at An Aird. It would have taken a winning margin of 13 goals for Fort to pip Caberfeidh to the division’s second promotion spot, but this always looked an unrealistic target. Wet weather ahead of the game led to a Saturday morning inspection, when the pitch was ruled playable. Inveraray’s Allan MacDonald was suspended for this one as he started a five-match ban which will stretch into next season, although he did travel with the squad. Ally Munro, Ally MacDonald, Grant Griffin, Garry MacPherson and youngster Ruaraidh Graham were also missing for the visitors but Nicholas Crawford, starting at full centre, was back in the side after injury. Douglas Dando also started. There was a minute’s silence ahead of throw up following the sad passing of former Lochaber U14 player Kyle Bruce. 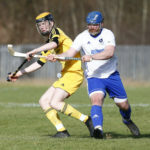 Fort William knew they had to go for goals, and the game was only 15 seconds old when Inveraray keeper Scott MacLachlan saved first with his stick and then with his feet. Fort William took the lead after eight minutes when Alexander MacMillan’s shot took a slight deflection off John Kennedy’s stick and ended up in the back of the net. Another good Fort William move saw an effort hit the side-netting on 11 minutes. Allan Cameron hit Inveraray’s only effort at goal during the early exchanges. Three efforts Fort William were ruled out for offside, and had it not been for some great goalkeeping from Inveraray’s Scott MacLachlan – and for some over-elaborate forward play – the score could have been much greater. Calum Shepherd added a second for the hosts, sending the ball low into the bottom corner of the net just 30 seconds after the restart. The heavy pitch didn’t suit Fort William and there was no further scoring. The match completes the 2017 Marine Harvest National Division league programme, with Inveraray finishing comfortably mid-table in fourth place behind Fort William and in front of Beauly on goal difference. 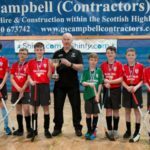 Caberfeidh, along with champions Skye Camanachd, will be promoted to the Marine Harvest Premiership.